There aren’t many writers’ conferences in Israel, but there was one this week and there will be another next week. This week’s, in Bar Ilan University, was free and I decided to go along yesterday. They gave us an exercise to sketch a floor plan of our first house and list five sensory details from it, and then discuss it with a partner. In a second exercise, we recalled a gift we’d received, reflecting on why it was valuable, what was symbolic about it and the stories behind it. In the poetry session with Linda Zisquit and Joy Katz, they invited people to relate a memory. Then they told us to “write a poem about something that scares you.” Writing the poem was pretty scary in itself, as I don’t write poetry. Not only did I write it, but I read it out loud. The finger is pointing at me. Ten thousand eyes are looking at me. Ten thousand ears are waiting for me to talk. I sit down and rest my head on my knees. In the fiction session with Evan Fallenberg and Joan Legant, we analysed a whole (three-paragraph) story by Etgar Keret and then wrote two paragraphs of our own story, starting with one of four prompts. The main advice from the session was: resist. Resist the obvious plot and resist obvious words. In a fascinating concluding session, Etgar Keret himself was interviewed by Evan Fallenberg. I wrote down just two of the many interesting things he said. In couple therapy, there’s an exercise in which one partner falls backwards and lets the other partner catch them. So, when you’re writing close your eyes, fall backwards and wait for the story to catch you. Sometimes it does. Other times you find yourself on the floor with a bump on your head. Only when you’re writing can you do anything you want. You can be rude to your mother, make a lot of noise, anything. Etgar doesn’t want to compromise this freedom for any audience by making his stories more universal. At the very end I took an awful picture with my phone. 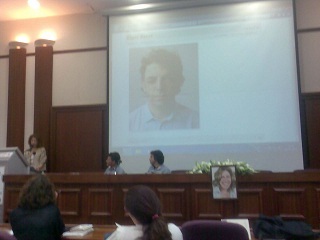 Keret is on the right and the screen shows his picture as it appears on the cover of his latest book: Suddenly, a Knock on the Door. I’ve never been to a creative writing conference. I know…I should change that. Sounds likes this Creative Writing Conference was a great source of getting the juices flowing. So glad you had a chance to participate and learn more regarding the writing craft. I love writing conferences! No matter how much you think you know, you always learn something more! That is a great poem–hopefully not borne from personal experience? Thanks. No, I’ve been put on the spot before, but not in that particular way. Sounds like a useful conference. I always come away from writing conferences really buzzing. Great that you got to read you poem. It’s very moving and I think that’s because there’s an element of that fear inside us all. I couldn’t have done that first activity. I lived in our first house for nine years and I can barely remember it at all. There are two questions that are now running round my head.Was the conference in English or Hebrew? Would the language of the conference have made a difference to the creative outcome? It was in English. Bar Ilan University runs an English creative writing course and this conference was connected to that. I’ve never been to such an event in Hebrew, but… I don’t think there can be any difference in the advice given, but I wouldn’t like to have to write in Hebrew. Glad the rare Israeli writer’s conference was a good one for you!